In Amazon's hometown, people turn to their computers to order everything from groceries to last-minute birthday presents to the odd toothbrush or medication forgotten from the store. If online shopping continues to grow at its current rate, there may be twice as many trucks delivering packages in Seattle's city center within five years, a new report projects—and double the number of trucks looking for a parking space. In the report, the Seattle Department of Transportation (SDOT) and the University of Washington's Urban Freight Lab at the Supply Chain Transportation and Logistics Center (SCTL) have analyzed solutions for alleviating urban congestion by making truck parking spaces more productive and reducing the growth of truck traffic. 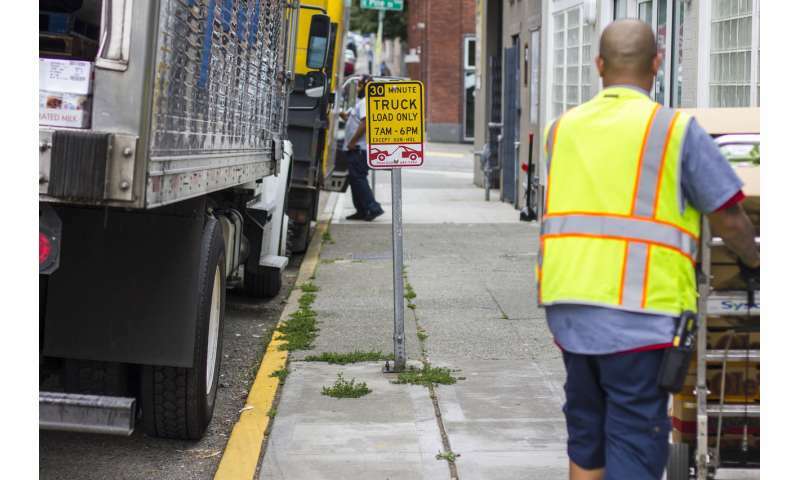 "Seattle is the perfect laboratory to find better ways of managing commercial truck parking and delivering packages in urban settings," said Anne Goodchild, SCTL director and a UW professor of civil and environmental engineering. "By testing data-driven solutions on our streets and in our buildings, we hope to reduce traffic in congested areas of the city as well as missed deliveries that frustrate consumers and retailers alike." By mapping privately owned delivery infrastructure for the first time, a team of UW researchers and students found that 87 percent of all the buildings in downtown Seattle, Uptown (also known as lower Queen Anne) and South Lake Union have to rely on the city's curb and alley space to receive deliveries. Only 13 percent of buildings have loading bays or docks that allow trucks to park on private property. That's why the report focuses on what's known as the "Final 50 Feet" problem: the last and surprisingly complicated leg of an urban delivery that begins when a driver must find a place to park a truck or vehicle—usually on a public street or alleyway—and ends when the customer takes receipt of their package. It's part of a broader research initiative spearheaded the by SCTL's Urban Freight Lab, which is partnering with SDOT, Nordstrom, UPS, the U.S. Postal Service and Charlie's Produce to re-think everything from how cities apportion curb and street space to how building owners manage the growing avalanche of packages delivered to urban towers. "Seattle is one of the fastest-growing cities in the country, and SDOT is committed to meeting the urban goods delivery challenges facing most big cities in the U.S.," said Christopher Eaves, project manager at SDOT. "We know that issuing parking tickets to companies who are simply trying to meet the daily delivery needs of residents and businesses isn't the right solution. So, our goal is to identify and implement scalable strategies that improve deliveries at existing buildings, as well as initiate strategic research to mine new data." The UW research team found that reducing the number of failed delivery attempts as well as the amount of time a delivery truck is parked in a loading space could offer significant public and private benefits. UW researchers and SDOT plan to test promising improvement strategies in and on the streets around the Seattle Municipal Tower this spring. "These two actions alone could reduce congestion and free up curb space for cars, buses, bicycles and other people who need to use that shared public space," said Barbara Ivanov, director of the Urban Freight Lab. "Those efficiencies have the added benefit of saving retailers and delivery services money, and getting orders into the hands of customers faster." 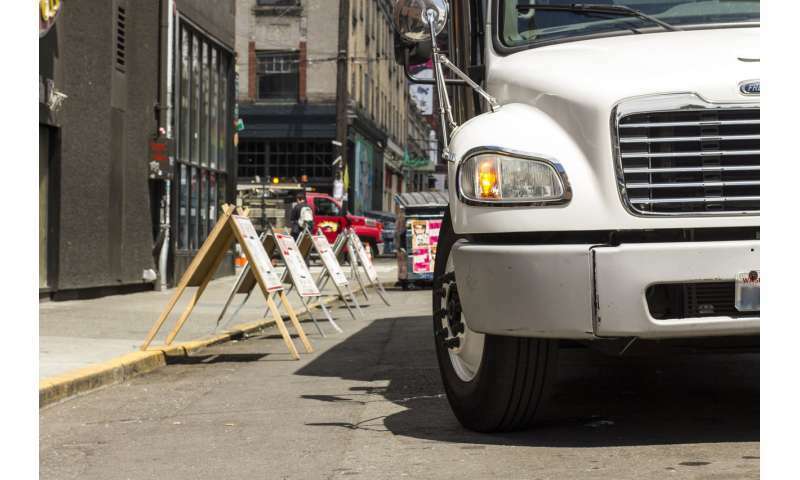 Cutting down on failed first delivery attempts has the potential to greatly reduce truck trips in Seattle, cut business costs and ensure that tenants in multifamily buildings can shop online and get their orders when they expect them, the report finds. By tracking real-world deliveries in a downtown office building—the Seattle Municipal Tower—a hotel, a residential building, a historic building and the retail mall at Westlake Center, the UW researchers discovered delivery drivers encounter logistical barriers that consume a significant portion of their time. 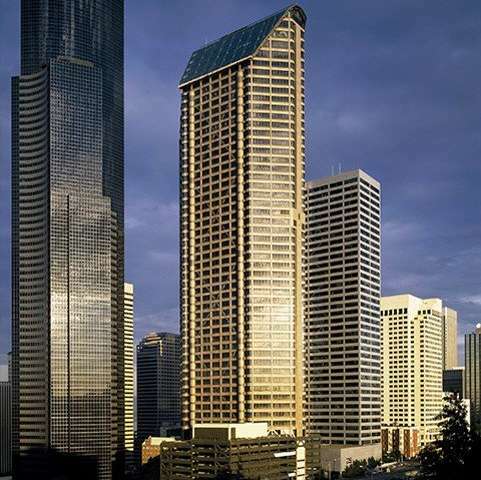 Clearing security in urban towers took 12 percent of the total time, and looking for tenants and riding freight elevators took 61 percent of the total time. The report estimates that 73 percent of delivery time is spent in buildings and, as a result, the Urban Freight Lab will pilot test a smart locker system in the loading bay of the Seattle Municipal Tower. This could substantially reduce delivery time, failed first deliveries and the amount of time that delivery trucks occupy parking spaces that serve the building. The smart locker system pilot will allow drivers from multiple delivery companies to securely leave packages in the vestibule of the 62-story Municipal Tower. Then, the locker system will notify enrolled tenants of deliveries by text or email and send a lock code, allowing them to pick up the packages at their convenience rather than having to stop working and intercept a delivery person in their office. The Final 50 Feet project is the first time that SDOT, in partnership with the Urban Freight Lab, has analyzed both the street network and the city's vertical space such as office, hotel, retail and residential towers as one unified goods delivery system.